As construction progresses on Westmead’s new hospital building, work has also ramped up on the transition into the space, with staff continuing to prepare for the move. The Westmead Redevelopment project team has been supporting a major transition program with operational leaders and executive to ensure the new hospital building and the refurbished spaces operate successfully. 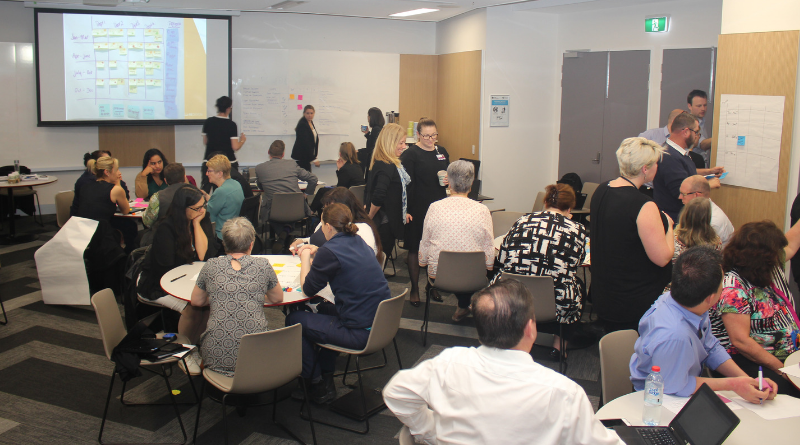 The team has been meeting with project user groups and staff across Westmead Hospital, The Children’s Hospital at Westmead and the University of Sydney to discuss moving into the new building and opportunities to do things differently. Westmead Redevelopment project director Amanda Green said the meetings had revealed a number of different areas requiring change, across a range of services. “This process has really been about looking at the changes we need to make ahead of the transition to the new building,” she said. “New models of care are being developed to help transition services into their new spaces and ensure we are continuing to provide the best care for our patients. “We are also working with operational leaders and the executive on everything from how people access the hospital, to how services in the new and existing buildings interact, including issues like cleaning, security, storage and disaster management. On September 7, more than 50 staff involved in the change program participated in a workshop, aimed at mapping out the specific activities needed to prepare to transition into the new building. “The workshop was really an opportunity to share experiences so we can understand staffs’ goals, start creating momentum and preparing for change, and to get people thinking about the work needed in the lead-up to the move into the new building,” Amanda said. Westmead Hospital and The Children’s Hospital at Westmead is undergoing a transformation, with a new hospital building set to open in 2020, and several existing spaces at Westmead Hospital being refurbished. A number of services will move into the new building, including emergency, surgery, imaging and pharmacy. The staff in the transitioning services will continue to progress their initial change planning work, including identifying staff and consumers to be involved in regular change meetings. Find out more about the Westmead Redevelopment project. New Westmead multi-storey car park – what does it mean for patients/visitors? 30 Nov, 2017, 10:49 am Emma Smith Comments Off on New Westmead multi-storey car park – what does it mean for patients/visitors?